Twenty-five years ago, long before he became Chief Exploratory Officer of Natural Habitat Adventures, Olaf Malver pioneered a new sea kayaking route along the wild northwest coast of Irian Jaya, the most remote province of eastern Indonesia. Read Olaf’s firsthand account of why it was one of the craziest expeditions of his life. 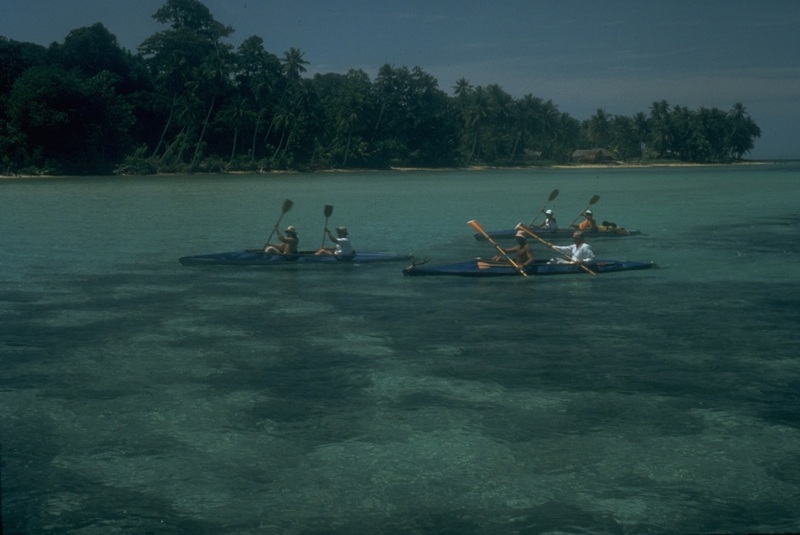 Exploratory paddling along the north coast of Irian Jaya. The words ricocheted inside my aching skull. Slowly, I opened my eyes, not knowing where I was. I looked up, and an image of a stunningly beautiful woman’s face appeared above me. I saw the eyes of a young doe in springtime and a perfectly shaped small mouth producing a sweet yet reserved smile – was this an angel in Paradise? Before I could inquire, she took charge, saying, “Sorry, mister, you need now operation!” She was endearing yet decisive – dressed all in military fatigues with a medical colonel’s insignia on her shoulders. 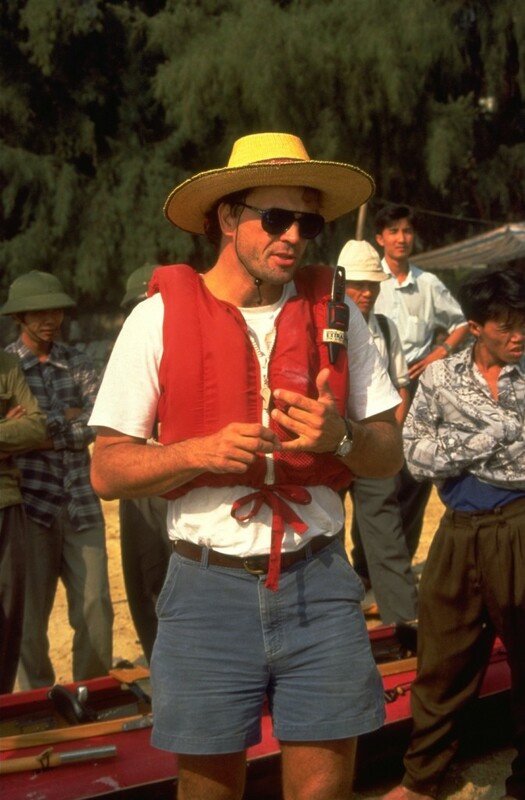 Olaf guiding in the tropics 25 years ago. Thus firmly prompted, it all came back to me. I was the expedition leader of a small group of Westerners, pioneering a sea kayaking journey along the wild northwestern shores of Irian Jaya, the most remote province of eastern Indonesia. After a week of paddling we decided to leave our folding sea kayaks behind on the coast and venture deep into the interior on foot, crossing the steep mountain ridges of the central Van Dammen Peninsula. We were searching for the elusive lesser bird-of-paradise, Paradisaea minor. There are just seven species in the genus Paradisaea, all with spectacular plumages prized by traders for centuries. The specimens brought back to Europe from trading expeditions prior to the 16th century had been prepared by native traders who removed the birds’ wings and feet so the feathered skins could be used as decorations. Later explorers knew nothing of this, and in the absence of information, many legends arose about the fabled birds. They were briefly thought to be the mythical Phoenix bird. The often footless and wingless condition of the skins led to the belief that the birds never landed but were kept permanently aloft by their beautiful plumes. The lesser bird of paradise for which we were searching for is medium-sized, with a body up to a foot long. It is maroon-brown in color with a yellow crown and brownish-yellow upper back. The male’s throat is dark emerald-green, complemented large ornamental flank plumes that are deep yellow at their base and fade outward into white. It is an absolutely stunning bird, and while elusive, we considered it a worthwhile pursuit on an expedition such as ours. On our third day of making slow progress through the green jungle hell of the Van Dammen rain forest, we finally heard its distinct call : Ghi gagii – Ghi gagii – Ghi Gaah! And high up in the nutmeg canopy above our heads, we spotted two males with their amazing white and yellow fans of feathers displayed. It was truly a brief moment of exultation even for amateur naturalists and explorers like us! Our mission was accomplished, but the expedition excitement was not over yet – on the contrary. 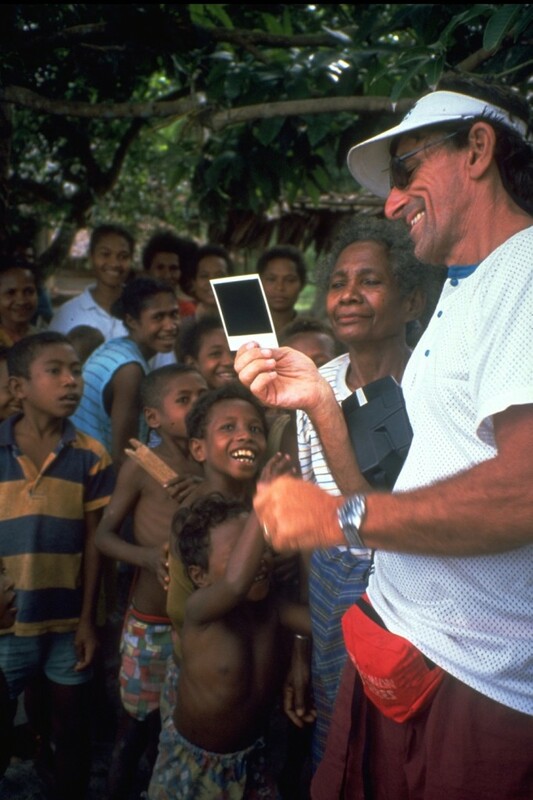 Marco sharing Polaroid photos with the locals. Perhaps because we were always curious and on the lookout for those magic moments of special encounters with our natural habitat, we totally forgot about ourselves and our physical wellbeing. The first week of thrashing through the bush had taken its toll healthwise on our entourage. My friend John had broken out with a serious bout of malaria – the bad one, Plasmodium Falciparium – and was by now delirious and shivering violently from fever. Magnus, the large and quiet Swede (who was a former competitive mogul skier), had been attacked by sweat bees when wearing only a skimpy bathing suit and flip flops. Marco, a former member of the merchant marine, had stepped on a long thorn that had pierced his foot. And a couple of us had developed bad skin infections from the cuts and bruises one always sustains while chopping our way through a tropical rain forest, myself included. An initial innocuous small cut in my right ankle had by now developed into a raging staphylococcal infection. Dark black lines were starting to form along my veins, making their way up my legs, which I knew could ultimately lead to septic shock. 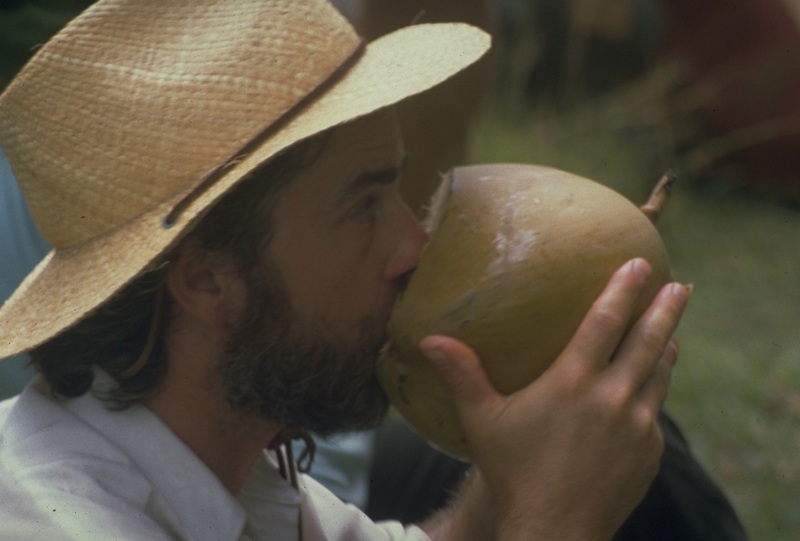 But being the expedition leader, my first task was to take care of my guests, in particular John who by now was very weak and needed quick intravenous treatment with a massive dose of quinine derivatives. Removing the thorn from Marco’s foot. It was sheer luck when we stumbled onto an Indonesian military field hospital. I immediately led John to the first aid station in search of a medic to take care of him. He was first priority. But while seated in front of the receiving nurse, I simply fainted from heat exhaustion and being weak from my threatening infection. The next thing I remembered was waking up in front of Angel. When she told me I needed an operation, I just mumbled “Okay,” and without hesitation she stuck two fingers in her mouth and blew hard to produce a high-pitched whistle, just like hecklers at the ballpark. She then looked at me with subdued compassion, as if something unpleasant was about to occur. Indeed, her whistle produced a large native guy with hairy legs, dressed only in tattered jungle shorts. Without further explanation, he pinned me down by sitting squarely on my chest and holding down my arms firmly with his strong hands. Another two medics held down my legs, including the infected one. I was made completely immobile, staring with fear straight into the crotch of the large Papuan above me. Then came the third and equally kind apology from Angel: “Sorry, mister – no anesthesia.” Without further ado I felt the hot scalpel cut deeply into my festering wound and could not hold back a loud scream. Everything went black. My fellow clients told me later that they had seen me accompany John into the tent, and the next sound they heard coming from there was a high-pitched, blood-curdling scream that cut sharply through the otherwise still tropical air around camp. The expedition leader was being cut into temporary silence. I later woke up on a stretcher and looked down at my newly operated-upon leg. It was now covered with a wet bright-yellow gauze poultice tied across the ankle. Turns out that my talented local guide Chris Khorua who had lived in the jungle as a commando for years (and now operates a whorehouse and a crocodile farm on the side) had been out digging up a root from a plant, which he cooked up and produced a poultice to cover the wound. That did the trick, and the fever and infection subsided quickly. Thirsty through our traverse of the Van Dammen Peninsula. John equally improved fast enough for us to continue our journey home, though he ended up in the intensive care unit for two weeks at Children’s Hospital in San Francisco before fully recovering. I also healed well in a cheap flophouse in Manokwari before heading home. I never saw Colonel Angel again – she was called out to a neighboring village struck by malaria immediately after my operation – but I shall never forget her. Never heard her “Sorry, Mister” again, which maybe was a good thing. 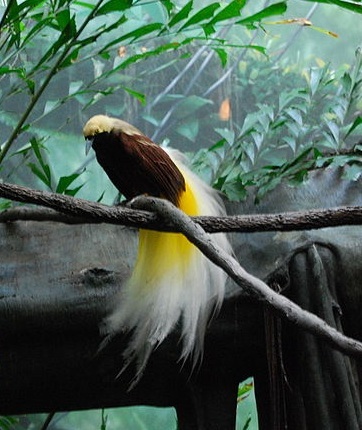 But beautiful and elusive like the bird-of-paradise she was. Ghi gagii – Ghi gagii – Ghi Gaah!